Wing span: 2 - 2 3/4 inches (5 - 7 cm). Identification: Quite variable. Upperside orange-brown, often darker at base, with black outer margins especially on forewing; male has black scales on veins. Underside of hindwing with basal disk or light brown orange-brown with pale submarginal band; spots silvered or unsilvered. Life history: Males patrol during the day in open areas. Eggs are laid singly on leaf litter near host plant. Unfed first-stage caterpillars overwinter, emerging in spring to feed on leaves. Flight: One flight from June-October, mainly July-August. Adult food: Flower nectar including Gaillardia, rabbitbrush, purple mints, and shrub cinquefoil. 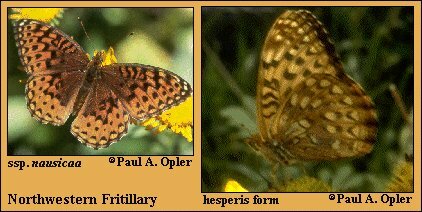 Habitat: Forest openings, meadows, and open hillsides. Range: Western mountains from central western Alaska, Yukon, and Northwest Territories south to central California, Arizona, and New Mexico. Conservation: Not usually of conservation concern. Subspecies elko Austin and hanseni Emmel and Emmel are of conservation concern because of their small ranges. The former may be threatened by invasive alien weeds including smooth brome and/or cheatgrass.